It's Not Just a "Global Test"
Bush's camp was out in force on weekend talk programs with one particularly non-sensical talking point regarding Kerry's comment during the debate, when he talked about never ceding the right to defend the U.S., but that the means to that end must pass a "global test". The Bush camp pulled that two word phrase out of context in order to make fun of it. Jon: I'm joined by Senior Political Analyst Rob Corddry. Rob, I have to tell ya. What is going on? The media is playing this out like this "Global Test" phrase is up for grabs with what Kerry meant by it, when it really seems very clear to anyone listening to the context. Rob: Yes, Jon, and therein lies the fundamental problem with the Kerry campaign: the enormous gap between what John Kerry means, and what the Republicans say he means. Jon: I don't think I follow what you're saying. Rob: Look, Jon, the Bush camp's been very clear that John Kerry would give France the veto over U.S. security. And John Kerry has had a real hard time being straightforward about admitting what the Republicans say he believes. Jon: But why should he admit that? It is the opposite of what he said on the debate. Rob: Right, Jon. And that's the problem -- this constant flip-flopping. Jon, say what you will about George W. Bush, but you always know exactly what he says John Kerry stands for. Jon: But this was not a flip-flop. Kerry's been relatively clear and consistent in this one. Rob: No, see, Jon. First he's a flip-flopper. Now he's not a flip-flopper. Which is it John Kerry? Huh? Make up your mind, man! Jon: ... Rob Corddry, everyone. We'll be right back. I don't think the United States will allow Kerry to win because Bush loses, because there's a war, and there's terrorism, etc. "Look, you don't know me very well yet. You should, and maybe I'm at fault. But let me say this. I'm like you. I love this country because it's been so good to me and my family, and in my case maybe even better than it has been for most of you. I loved it so much I volunteered to risk my life. And I did. And I got medals for it, and maybe I deserved them and maybe I didn't. But I did something much more important than that. I agreed to KILL for my country. And I did it more than once. And I came back with such a detestation of what I had to do in a war that looked to me like it should never have happened. And I said to myself, 'For the rest of my life I'm going to fight to make sure that we NEVER go to war unless beyond a reasonable doubt it's essential to do it.' And that's why I'm so unhappy about what happened here. I was misled. I voted for this war. It will never happen again ... because I remember Vietnam." 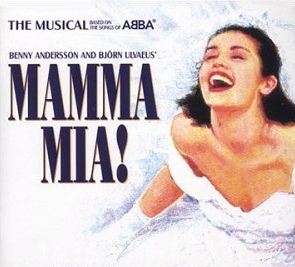 Last night I went to the musical Mamma Mia at the National Theater. I don't go to live performances often, the last time to see Joseph and the Amazing Technicolor Dreamcoat in Boston a few years ago. I should go more often. I really enjoy it, always more than I think beforehand. But isn't that true of many enjoyable activities that for some reason or another we don't do very often? The original premise of NBC's latest reality show Average Joe is simple enough. How will a beautiful woman react when faced with a choice among average looking men to date instead of men more in line with her own good looks? Not surprisingly, she fell for some of them. At least, I hope no one was surprised. A good looking fit woman (or man for that matter) can indeed find chemistry somewhat outside the normal range of good looks and fitness they would otherwise consider. The world outside the confines of the set of a reality TV show should reflect this more, but doesn't, unfortunately. Perhaps one interesting conclusion reflected by Melana's choices is that fitness and body type is a more important factor, at least for her, than other aspects of good looks. But this week there's a new twist. With the field down to 3 average guys, 3 new good-looking guys have been introduced for her to choose from. This has now turned into a more interesting experiment. Will good looks distract her from the bonds she has been forming over the past few weeks? Even though this situation is highly contrived, I'm suddenly much more interested to see how this plays out. The new men on the scene will test Melana's mettle. What will happen next I'm less sure about.